True, he did play in an ill-advised hair metal band in which he was the only brunette with a bunch of bottle blonds. Even so, Carmine Appice has had a long and illustrious, and now he has his own Sabian limited edition ride cymbal. We kid Carmine, but that's only because his resume is so darned impressive: The Vanilla Fudge, Jeff Beck, Cactus, Rod Stewart, Ozzy Osbourne, Blue Murder -- with his combination of R&B grooves, rudimentary chops and sheer power, the man has literally launched and defined genres. Which is why Sabian has bestowed upon him the limited edition Carmine Appice Rock Ride cymbal. This 22" medium-heavy ride is designed to sound like classic '60s cymbals. It has a dark tone, but one that cuts through like brighter cymbals do. 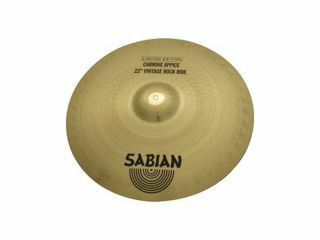 To ensure that strokes don't get lost in a song, the Sabian ride cymbal has strong stick definition and a punchy bell. Only 200 of these babies are available, so if you want to ride like Appice, don't wait. The list price is $769.00US. For more information, visit the official Sabian website.